Cook green beans as directed on package. Drain; rinse with cold water to cool. Trim fennel bulbs; cut in half. Cut each half into 1/4-inch slices. 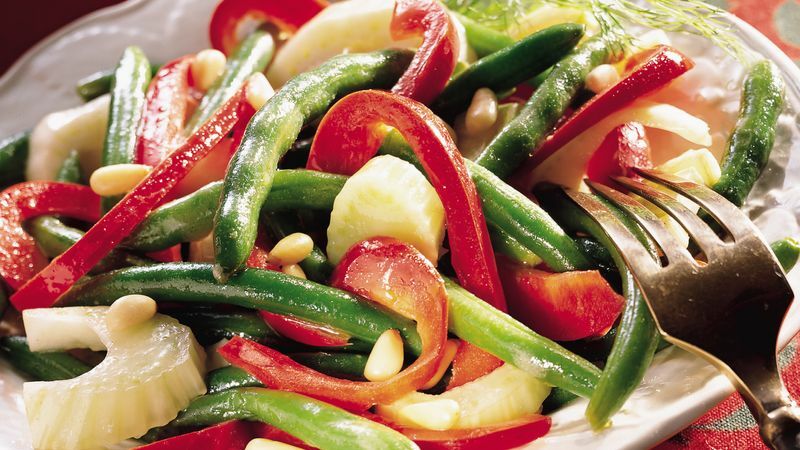 In large bowl, combine green beans, fennel and bell peppers. Cover; refrigerate until serving time. Meanwhile, in small bowl, combine vinegar and mustard; beat with wire whisk until well blended. On cutting board, mash garlic and salt together with fork to make a paste. Beat into vinegar mixture. Slowly beat in oil until well blended. Cover; refrigerate until serving time. When ready to serve, add dressing to vegetable mixture; toss gently to mix. Arrange on large serving platter. Sprinkle with pine nuts. Garnish with fresh fennel tops, if desired.